Home Web Development How to work with File Input/Output Stream classes? Stream: A file is a collection of data storage in a memory with a specific name and a directory path. When a file is opened for reading or writing, it becomes a stream. The stream is basically the sequence of bytes passing through the communication path. There are two main streams: the input stream and the output stream. We are using input stream class for reading data from a file (read operation). It is responsible for accepting data in the form of bytes, streams, binary data, or strings from input devices such as keyboards, mouse, or other media. The output stream is used for writing into the file (write operation). The output part of the system displays processed data through devices such as monitors or printers. The System.IO namespace has multiple classes for performing various operations with files, following are some important classes of System.IO namespace.System.IO. The stream is an abstract class that provides standard methods to transfer bytes to the source. Stream Classes that need to read and write bytes from a particular source must implement the Stream classes. The Directory class is used for manipulating directories & subdirectories. It exposes many static methods for moving, copying, and deleting directories. Following is the sample code for Directory class. Create a console application and use the following code for better understanding. //Default created file location is in debug folder. The DirectoryInfo class is used to retrieve directory & subdirectory related information. Below is the sample code for DirectoryInfo class. 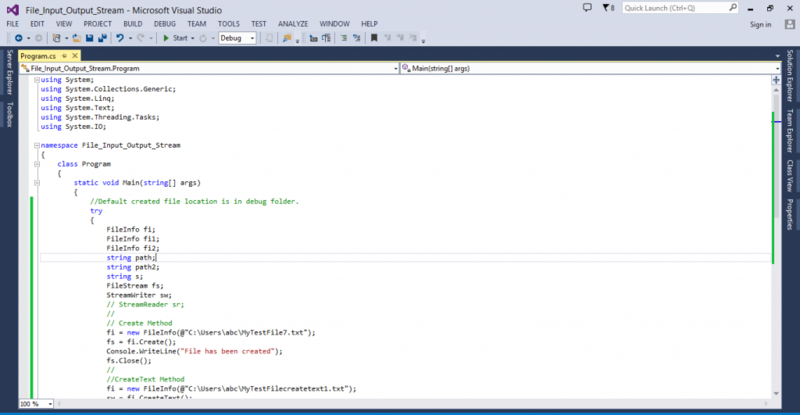 Create a console application and use the following code for better understanding. The DriveInfo class is used to retrieve drive-related information. Below is the sample code for DriveInfo class. Create a console application and use the following code for better understanding. File class is used to get file-related information. Below is the sample code for File class. Create a console application and use the following code for better understanding. FileInfo class is used to perform file-related operations like create, delete, copy, and move file etc. Below is the sample code for FileInfo class. Create a console application and use the following code for better understanding. The Path Class is used to perform operations on String instances that contain file or directory path information. 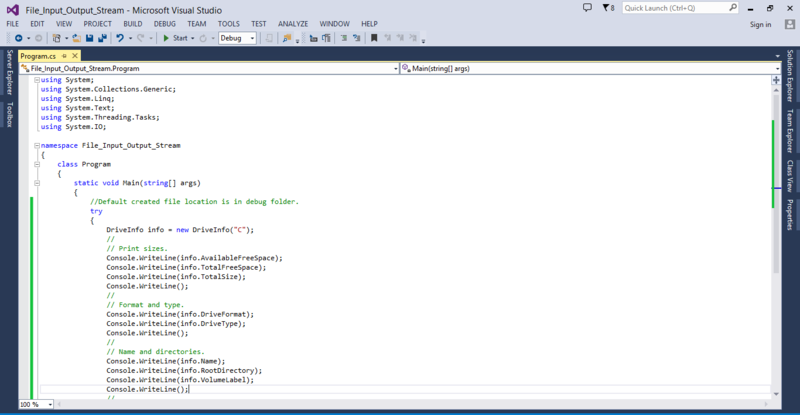 Below is the sample code for Path class. Create a console application and use the following code for better understanding. The FileStream class is derived from abstract class Stream which is in the System.IO namespace. 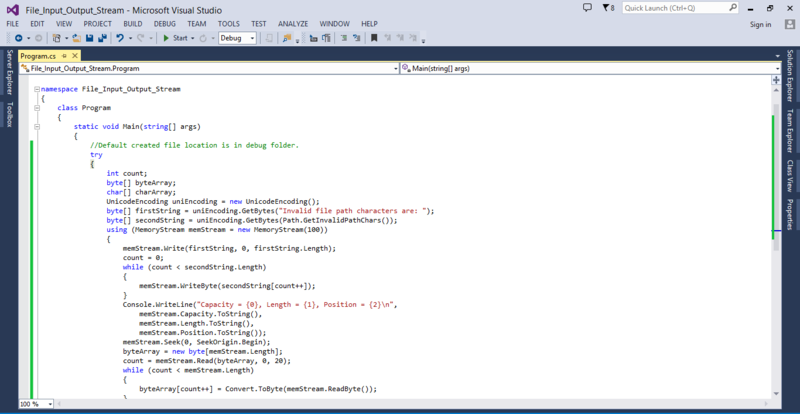 Below is the sample code for FileStream class. Create a console application and use the following code for better understanding. MemoryStream class and its members are used to read data in the memory stream. Below is the sample code for MemoryStream class. Create a console application and use the following code for better understanding. As we know that Buffered streams are used to provide better read/write performance.We use this class either read or write data but it can’t be used to perform both read and write operations together. Below is the sample code for BufferedStream class. Create a console application and use the following code for better understanding. Textwriter is another way to write a file. The StreamWriter classes are derived from TextWriter classes. Below is the sample code for TextWriter class. Create a console application and use the following code for better understanding. We have another class Textreader for reading a file. It represents a reader that can read a sequential series of characters. Below is the sample code for TextReader class. Create a console application and use the following code for better understanding. We use C# BinaryWriter Class for writing primitive types as a binary value in a specific encoding stream. Its Object works with Stream Objects that provide access to the underlying bytes. Below is the sample code for BinaryWriter class. Create a console application and use the following code for better understanding. We use C# BinaryReader class for reading primitive types as a binary value in a specific encoding stream. Its Object works with Stream Objects that provide access to the underlying bytes. Below is the sample code for BinaryReader class. Create a console application and use the following code for better understanding. We use streamReader Class for reading character-based data, Its found under System.IO namespace. Below is the sample code for StreamReader class. Create a console application and use the following code for better understanding. We use streamWriter Class for writing character-based data, Its found under System.IO namespace. Below is the sample code for SteramWriter class. Create a console application and use the following code for better understanding. We use StringReader class for reading a string from the string, It’s derived from TextReader class and also enables you to read a string synchronously or asynchronously. Below is the sample code for StringReader class. Create a console application and use the following code for better understanding. We use StringWriter class for manipulating a string, Its derived from TextWriter class. Below is the sample code for StringWriter class. Create a console application and use the following code for better understanding. I hope, this article would help you to understand about System.IO namespace. The role of System.IO is very important in c#. It helps you to read, write and manipulate any type of data. Its also helps you to retrieve information about directory, file, memory, drive, etc. Previous articleHow to use WinRunner through case studies in Software Testing? Next articleHow to Perform Usability Testing on Applications? How Basic Testing Principles Can Improve Quality Assurance?